All of Cambridge City, including the entire MIT campus, experienced either a water shortage or a water outage yesterday. A major water main broke in Kendall Square at Broadway and 3rd Street, according to the Cambridge City Web site. Water was restored to the MIT campus, except for Tang Hall graduate dormitory, by 10:35 p.m. last night, according to MIT’s 3-DOWN Services Status update Web page. 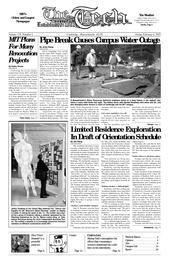 The Academic Resource Center recently completed its draft of the schedule for Orientation 2005, which will include an earlier closing date for the housing adjustment lottery than previous orientations have. Following the recent campus construction boom, MIT will shift its focus to renovating existing facilities, said Executive Vice President John R. Curry at the annual town gown presentation to the Cambridge Planning Board on Tuesday. “Instead of new buildings, we’re talking about renewal” in upcoming years, he said.